In regular coffee shops, the London Fog Latte is usually made with sweetened Earl Grey tea, vanilla syrup and cow’s milk. So, of course, I wanted to see if I could make an at-home version that involved less sugar (or none at all! ), additional botanical flavor, and plant based milk. 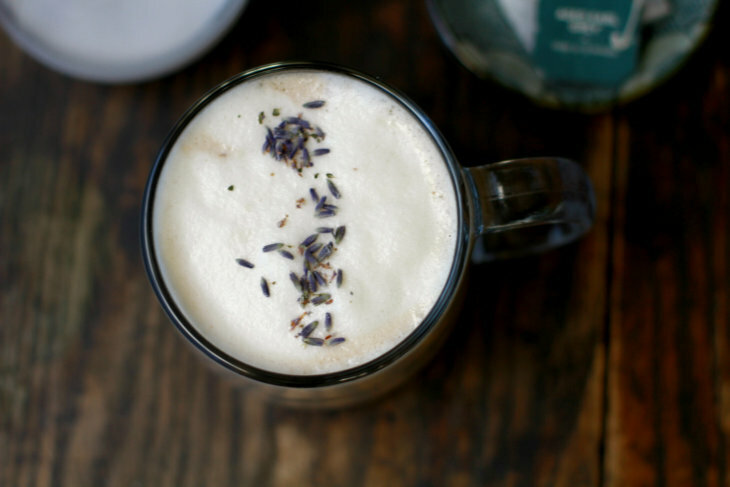 This Healthy London Fog Latte is a creamy, frothy concoction with a hint of sweetness, and a pleasing bergamot-lavender scent. Brew earl grey tea and lavender together in 8 ounces of hot water, and steep for 3 minutes (or according to tea instructions). In the meantime, heat the plant milk gently in a small pot. After 3 minutes, remove tea bags and strain out the lavender. Add the brewed tea, warmed plant milk, coconut butter, vanilla, and bergamot oil (if using) to the blender. Add 2-3 drops of stevia (you can always add more later). Blend until smooth and frothy. Taste and add more stevia if desired. Pour into a mug and enjoy. 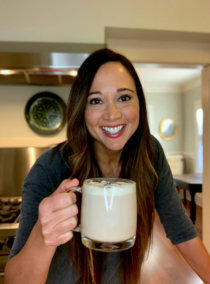 I hope you enjoy this recipe for the London Fog Latte.